홈쇼핑 부터 백화점까지, Lifestyle Upgrade 롯데홈쇼핑 새롭게 단장한 롯데홈쇼핑 앱을 소개합니다. ◆ 생생한홈쇼핑을 즐겨보세요! TV쇼핑 매장에서 홈쇼핑 라이브와 OneTV 라이브 방송을 함께 즐겨보세요. ◆ 믿을 수 있는롯데의 인기상품을 한 자리에! 품격의 백화점 상품부터 실속있는 땡큐딜 상품까지 만나보실 수 있어요. ◆ 색다른 즐거움을느껴보세요! 색다른 재미가 있는 L.캐스트 매장과 실시간 인기 키워드로 HOT한 아이템을 한 눈에 볼 수 있는 베스트매장, 1인 라이프 스타일 편집숍 레티트(LETIT) 매장까지! 즐거움 가득한 매장들을 지금 바로 둘러보세요. ◆ 편리한기능을 활용해보세요! 사진을 찍어 비슷한 상품을 찾는 카메라 검색부터 나만의 스타일을 찾는 스타일 검색까지! 새로운기능을 이용해 나만의 스타일을 업그레이드 해보세요. ◆ 앱 접근권한에 대해 안내 드립니다! 롯데홈쇼핑은 정보통신망법 제22조의 2(접근권한에 대한 동의)의 규정에 맞춰 서비스에 꼭 필요한 항목만을 필수접근하고 있습니다. [필수적 접근권한] - 단말기ID : 단말기 구별 및 식별 - 전화 : 어플리케이션 실행 및 앱푸시 발송(안드로이드 6.0이상 버전)[선택적 접근 권한] - 전화 : 콜센터 전화하기 (안드로이드 6.0미만 버전) - 카메라 : QR검색, 스타일 추천,이벤트, 상품평, 1:1문의 - 사진/저장소 : 스타일 추천, 이벤트, 상품평, 1:1문의 - 생체인식 : 생체인증로그인 - 마이크 : 음성 인식 ※ 기종별로 선택적 접근 권한 항목이 상이 할 수 있습니다. ※ 선택적 접근 권한은 해당기능을 사용할 때 동의를 받고 있으며, 앱 내 설정화면에서 변경하실 수 있습니다. ※ 앱 설치 오류 시에는 아래의가이드대로 진행해보세요. 1. 기기의 ‘설정’ 앱 열기 2. ‘애플리케이션’ 선택 3. 아래로 스크롤하여 ‘GooglePlay 스토어’ 선택 4. ‘저장공간’ 선택 5. ‘데이터 삭제’ 선택 6. Play 스토어를 다시 열고 다운로드 다시시도 * 완료 후 앱 또는 기기를 새로 시작하면 문제를 해결하는 데 도움이 됩니다. ◆ 롯데홈쇼핑 고객센터1899-4000 ◆ 앱 이용 관련 불편사항, 오류신고 : [email protected] (단말기종,OS정보 기재) 더욱 편리한 쇼핑환경을 위해 최선을 다하겠습니다. 감사합니다. From home shopping todepartment store Lifestyle Upgrade Lotte Home Shopping Introducingthe newly renovated Lotte Home Shopping app. ◆ Enjoy a vivid homeshopping! Together with Home Shopping Live and OneTV Live Broadcastin TV shopping stores. ◆ One of Lotte's popular products that youcan trust! You can see everything from the classy department storeproducts to the ready-made goods. ◆ Please feel different fun! L.Cast store with a different fun and the best store where you cansee HOT items at a glance with popular keyword in real time, 1person lifestyle editing shop Retit (LETIT) to the store! Take alook around the delightful stores now. ◆ Use the convenientfunction! From camera searching to finding similar items by takingpictures, to style searching for your own style! Upgrade your ownstyle with new features. ◆ We will show you how to access the app!Lotte Home Shopping is in accordance with Article 22-2 (Consent toAccess Rights) of the Information and Communications Network ActOnly necessary items are essential for service. [Essential AccessRights] - Terminal ID: Terminal identification and identification -Phone: Launching apps and sending app push (Android 6.0+) [OptionalAccess Rights] - Phone: Calling the call center (Android versionunder 6.0) - Camera: QR Search, Style Recommendation, Event,Reviews, 1: 1 Inquiry - Photo / Store: Style Recommendation, Event,Reviews, 1: 1 Contact Us - Biometrics: Biometrics login -Microphone: Speech Recognition ※ Selectable access permission itemsmay be different for each model. ※ Selective access rights areagreed upon when you use the feature, and you can change them onthe Settings screen in the app. ※ If you install the app, pleasefollow the guide below. 1. Open the "Settings" app on your device2. Select 'Application' 3. Scroll down and select "Google PlayStore" 4. Select "Storage space" 5. Select "Delete data" 6. ReopenPlay Store and try download again * After you're done, starting anew app or device will help you troubleshoot the issue. ◆ LotteHome Shopping Customer Center 1899-4000 ◆ Applicationinconvenience, error report: [email protected] (terminaltype, OS information entry) We will do our best for a moreconvenient shopping environment. Thank you. 홈쇼핑 부터 백화점까지, Lifestyle Upgrade 롯데홈쇼핑 새롭게 단장한 롯데홈쇼핑 앱을 소개합니다. ◆ 한곳에모인 롯데 ON 롯데홈쇼핑에서 몰이동을 통해 별도의 앱 설치 없이, 롯데홈쇼핑, 롯데닷컴, 하이마트, 롯데마트,엘롯데,롯데프레시, 롭스까지 7개의 온라인 쇼핑몰을 자유롭게 이용하실 수 있어요. ◆ 편리한 로그인 기능 제공! 하나의 앱에서L.point 아이디로 한 번만 로그인하면 7개의 롯데 온라인 쇼핑몰을 별도의 로그인 없이 간편하게 이용하실 수 있어요.◆ 원하는 검색을 한눈에! 롯데 ON에서는 한 번에 원하는 상품을 검색할 수 있고, 고객님의 관심 상품도 추천해 드려요.◆ 생생한 홈쇼핑을 즐겨보세요! TV쇼핑 매장에서 홈쇼핑 라이브와 OneTV 라이브 방송을 함께 즐겨보세요. ◆ 색다른즐거움을 느껴보세요! 색다른 재미가 있는 L.캐스트 매장과 실시간 인기 키워드로 HOT한 아이템을 한 눈에 볼 수 있는베스트 매장, 1인 라이프 스타일 편집숍 레티트(LETIT) 매장까지! 즐거움 가득한 매장들을 지금 바로 둘러보세요. ◆편리한 기능을 활용해보세요! 사진을 찍어 비슷한 상품을 찾는 카메라 검색부터 나만의 스타일을 찾는 스타일 검색까지!새로운 기능을 이용해 나만의 스타일을 업그레이드 해보세요. ◆ 앱 접근권한에 대해 안내 드립니다! 롯데홈쇼핑은정보통신망법 제 22조의 2(접근권한에 대한 동의)의 규정에 맞춰 서비스에 꼭 필요한 항목만을 필수접근하고 있습니다. [필수적 접근 권한] - 단말기ID : 단말기 구별 및 식별 - 전화 : 어플리케이션 실행 및 앱푸시 발송(안드로이드6.0이상 버전) [선택적 접근 권한] - 전화 : 콜센터 전화하기 (안드로이드 6.0미만 버전) - 카메라 :QR검색, 스타일 추천, 이벤트, 상품평, 1:1문의 - 사진/저장소 : 스타일 추천, 이벤트, 상품평, 1:1문의 -생체인식 : 생체인증 로그인 - 마이크 : 음성 인식 ※ 기종별로 선택적 접근 권한 항목이 상이 할 수 있습니다. ※선택적 접근 권한은 해당 기능을 사용할 때 동의를 받고 있으며, 앱 내 설정화면에서 변경하실 수 있습니다. ※ 앱 설치오류 시에는 아래의 가이드대로 진행해보세요. 1. 기기의 ‘설정’ 앱 열기 2. ‘애플리케이션’ 선택 3. 아래로스크롤하여 ‘Google Play 스토어’ 선택 4. ‘저장공간’ 선택 5. ‘데이터 삭제’ 선택 6. Play 스토어를다시 열고 다운로드 다시 시도 * 완료 후 앱 또는 기기를 새로 시작하면 문제를 해결하는 데 도움이 됩니다. ◆롯데홈쇼핑 고객센터 1899-4000 ◆ 앱 이용 관련 불편사항, 오류신고 : [email protected](단말기종, OS정보 기재) 더욱 편리한 쇼핑환경을 위해 최선을 다하겠습니다. 감사합니다. From homeshopping to department store Lifestyle Upgrade Lotte Home ShoppingIntroducing the newly renovated Lotte Home Shopping app. 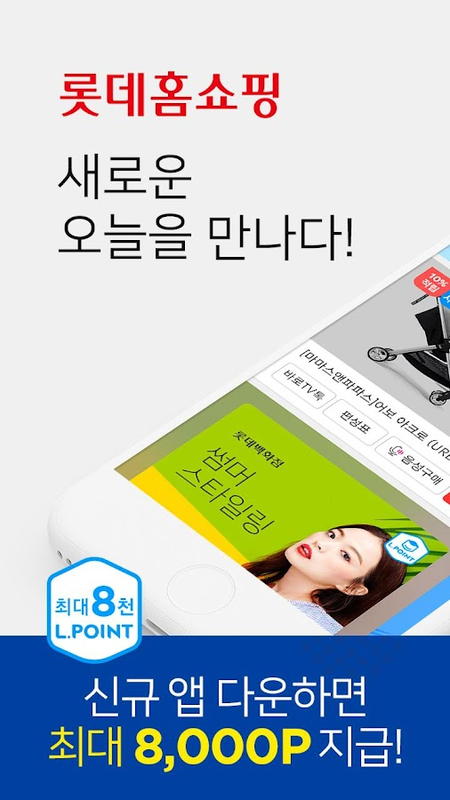 ◆ Lottegathered in one place Without a separate app installment throughthe mall movement at Lotte Home Shopping, Lotte Home Shopping,Lotte.com, Hi Mart, Lotte Mart, El Lotte, Lotte Fresh, Rops Sevenonline shopping malls are available at your disposal. ◆Convenient login function! If you only sign in once with an L.pointID in one app, You can easily access 7 Lotte online shopping mallswithout a separate login. Want to search at a glance ◆! InLotte ON, you can search for desired products at once, We alsorecommend your favorite items. ◆ Enjoy a vivid home shopping!Together with Home Shopping Live and OneTV Live Broadcast in TVshopping stores. ◆ Please feel different fun! L. Cast store with adifferent kind of fun and the best store where you can see the HOTitems at a glance with popular keywords in real time, 1 personlifestyle editorial shop LETIT Store! Take a look around thefun-filled stores now. ◆ Use the convenient function! From camerasearching to finding similar items by taking pictures, to stylesearching for your own style! Upgrade your own style with newfeatures. ◆ We will show you the right to access the app! LotteHome Shopping is in accordance with Article 22-2 (Consent to AccessRights) of the Information and Communications Network Act Onlynecessary items are essential for service. [Essential AccessRights] - Terminal ID: Terminal identification and identification -Phone: Application launch and app push (Android version 6.0 orhigher) [Optional Access Rights] - Phone: Calling the call center(Android version 6.0 or earlier) - Camera: QR search, stylerecommendation, event, reviews, 1: 1 inquiry - Photo / Store: StyleRecommendation, Event, Reviews, 1: 1 Contact Us - Biometrics:Biometrics login - Microphone: Speech Recognition ※ Selectableaccess permission items may be different for each model. ※Selective access rights are agreed upon when you use the feature,and you can change them on the Settings screen in the app. ※ If youinstall the app, please follow the guide below. 1. Open the"Settings" app on your device 2. Select 'Applications' 3. Scrolldown and select "Google Play Store" 4. Select 'Storage space' 5.Select "Delete data" 6. Reopen Play Store and try download again *After you're done, starting a new app or device will help youtroubleshoot the issue. ◆ Lotte Home Shopping Customer Center1899-4000 ◆ Application inconvenience, error report:[email protected] (Describe terminal type, OS information) Wewill do our best for a more convenient shopping environment. Thankyou. SCM앱은 롯데홈쇼핑 파트너사를 위한 전용 앱입니다.어디서나 빠르고 간편하게 롯데홈쇼핑 SCM을 이용해보세요.■ 주요기능1. 주문/취소/반품 현황 확인 : 원하는 기간의 주문접수/미출고/재고부족/반품접수/발송불가/품절 현황을 확인할 수있습니다.2. 고객 VOC 답변등록 : 고객 VOC 문의에 대한 답변을 등록 할 수 있습니다.3. 상품가격승인 : MD가요청한 상품에 대해 가격변경 승인을 할 수 있습니다.4. 입고예약 : 물류센터 입고상품의 입고검사 시간을 예약하고,예약내용을 확인할 수 있습니다.5. 편성확인/공급계획 : 방송 전, 공급계획 일정 및 수량을 등록할 수 있습니다.6.입고요청등록 : 추가 입고 시, 입고요청 할 수 있습니다.7. 판매가능수량 변경 : 상품의 판매가능수량을 변경할 수있습니다.SCM app is the only app for Lotte Home Shoppingpartners.Anywhere, quickly and easily, try using the Lotte HomeShopping SCM.■ Key Features1. Order / Cancel / Return Status Check:You can check your order receipt / US factory / Out of stock /return receipt / cash sent / sold into the desired period.2. VOCCustomer responses registration: You can register your answers tocustomer inquiries VOC.3. commodity price Approval: MD You canchange the price approval for requested items.4. wearingreservation: You can check the schedule time to test the product,wearing wearing logistics center, and schedule information.5. Checkorganizing / Supply Planning: broadcast before, you can registeryour supply planning schedules and quantities.6. wearing a requestRegistration: You can request to wear, when to wear added.7. SalesQuantity Change: You can change the number of products availablefor sale. W쇼핑(W-shopping)은 온ㆍ오프 라인의 9개 미디어사와 인쇄, 유통, 외식 등 16개 계열사가 함께하는종합미디어그룹 미디어윌의 자회사입니다. 이전에 볼 수 없었던 새롭고 놀라운 쇼핑의 세계로 고객들을 초대하기 위하여 오랜기간 치열하게 고민하여 상품 판매형 데이터방송(T-Commerce)을 개국했습니다. 모바일 앱에서 현재 방송 중인 상품을확인하고, 직접 구매 하실 수 있습니다. 지금까지 볼수 없었던 새로운 쇼핑, W쇼핑에서 함께하세요! ■ 앱 접근 권한동의 규정 안내 2017년 3월 23일 시행되는 정보통신망법 제 22조의 2(접근권한에 대한 동의)의 규정에 맞추어서비스에 꼭 필요한 항목만을 필수접근하고 있으며, 그 내용은 아래와 같습니다. [필수적 접근 권한]- 기기 및 앱 기록권한 : 더블유쇼핑 앱 실행 시, 서비스 최적화 및 오류 확인 [선택적 접근 권한]- 연락처 및 알림 권한: 푸시알림등록 및 수신 *선택적 접근권한의 허용에는 동의하지 않아도 해당 기능이외의 서비스 이용은 가능합니다. W-shoppingis a subsidiary of nine media companies on and off line, and MediaGroup, a comprehensive media group with 16 subsidiaries includingprinting, distribution and dining out. In order to invite customersto a new and incredible shopping world that has not been seenbefore, we have opened up T-Commerce for commodity sales for a longtime. You can view the current products on the mobile app andpurchase them directly. Join us in new shopping, W shoppingthat we have never seen before! ■ App Access Permission ConsentGuidelines In accordance with the provisions of Article 22.2(Consent to Access Rights) of the Information and CommunicationsNetwork Act, enforced on March 23, 2017 Only necessary items areessential for service, and the contents are as follows. [EssentialAccess Rights] - Device and App History Permissions: Optimize yourservice and check for errors when running the W. Shopping app[Optional Access Rights] - Contact and notification permissions:Register and receive push notifications * If you do not agree toallow selective access, you can use services other than thosefunctions. 열.열.히 사모하는 마음으로! 누구나 10%할인 + 10%적립! 이제 24시간 언제든지, 홈앤쇼핑 앱에서 10%& 10% 혜택을 만나세요! 1) 쿠폰없이 자동적용 10% 즉시할인! 구매횟수 제한 없이 살 때마다 10% 즉시할인됩니다. 2) 방송 및 텐텐+ 상품 10% 자동적립! 구매금액의 10%를 자동으로 적립해드립니다. 3) 매일 매일!핫딜 놓치면 품절! 날마다 특가 상품을 만나보세요! 4) 다모아 신규 오픈 핫해 핫해! 인기 테마 상품 다 모았어요! [모바일 앱 기능 주요 안내] 1) 텐텐+에서 10%할인과 10%적립! 그리고 릴레이팡팡 혜택까지 한번에~! : 텐텐+와함께 NEW릴레이팡팡 달성을 이어가세요. 2) 방송 전에 미리 사고 싶을 때도, 방송을 놓쳤을 때도! 편성표에서는 항상구매가능! : 방송시간을 기다리지 않아도 편성표에서는 언제든 바로 구매가 가능합니다! 3) 나만을 위한 추천상품을만나보세요! : 힘들게 상품을 찾지 않아도, 홈앤쇼핑이 고객님의 취향을 반영한 추천상품을 보여드립니다! 4) 앱에서 바로질문하세요! 라이브톡 : 사이즈? 구성? 궁금한 점이 있으시면 라이브톡에서 메신저처럼 실시간 소통하실 수 있습니다. [앱접근권한 동의 안내] 정보통신망법 제22조의2(접근권한에 대한 동의) 규정 시행에 따라 서비스 이용에 필요한 접근권한을아래와 같이 안내 드립니다. [필수적 접근권한] - 기기정보 및 앱 기록권한 : 앱 서비스 최적화 및 오류 확인, 서비스분석 및 통계 [선택적 접근권한] - 전화 발신 및 통화 설정권한 : 앱 서비스 제공 및 최적화 - 사진, 미디어, 파일접근 권한 : 앱 서비스 제공 및 최적화 - 마이크 접근 권한 : 앱 서비스 제공 및 최적화 안드로이드 6.0 미만버전의 경우, 접근항목별 개별동의가 불가능하므로 모든 항목에 대해 필수 접근합니다. ※ 홈&쇼핑앱은 안드로이드OS 버전 4.1 이상에서만 동작됩니다. 원활한 서비스 제공을 위해 가능하시다면 안드로이드 OS 버전 4.1 이상으로업데이트하시는 것을 권장합니다. 앞으로도 편리한 모바일 쇼핑몰이 되기 위하여 최선을 다하겠습니다. 감사합니다. Inthe heat, in the heat, Everyone gets 10% off + 10% off! Now, at anytime, 24/7, you'll get 10% & 10% benefit from the Home &Shopping app! 1) Automatically apply without coupon 10% instantdiscount! Every time you buy without limit, you get 10% offinstantly. 2) Broadcasting & Tenant + 10% Auto Earning! 10% ofthe purchase amount will be automatically credited. 3) Every day!Hassle Miss out of stock! Meet the specials every day! 4) Newlyopened in Damoa Hot Hot! I have collected all popular themes! [Mobile application function main guide] 1) Ten percent + 10%discount and 10% earn! And to the benefits of Relay Fang once ~! :Continue to achieve NEW Relay Fang with Tenten +. 2) When you wantto buy beforehand, even when you miss the broadcast! Alwaysavailable in the programming list! : Even if you do not wait forthe broadcast time, you can buy it at any time in the schedule! 3)Meet recommended products for you! : Even if you do not find theproduct hard, Home & Shopping will show you recommendedproducts that reflect your taste! 4) Ask directly from the app!Live chat : size? Configuration? If you have any questions, you cancommunicate in real time like Live Messenger instant messenger. [Guide to permission of app access right] In accordance withArticle 22-2 (Consent to Access Rights) of the Information andCommunications Network Act, We will guide you through the necessaryaccess rights as follows. [Essential Access Rights] -Device information and app history permissions: optimize appservices and check for errors, service analysis and statistics [Optional Access Rights] - Set up phone calls andcalls Permissions: Serving and optimizing app services -Photos, media, and file access: Providing and optimizing appservices - Microphone access rights: App service provisioning andoptimization For Android 6.0 and lower versions, individualaccess by access item is not possible. ※ Home & Shopping appworks only with Android OS version 4.1 or later. If possible, werecommend updating to Android OS version 4.1 or higher for smoothservice. We will do our best to be a convenient mobileshopping mall in the future. Thank you. 새로운 소셜커머스의 등장! 주연홈쇼핑과 함께 하세요. 신규 회원 가입 시 5천원 깜짝 쿠폰 증정! 공동구매를 통한 깜짝놀랄만한 파격할인가 제공! ◆ 15년차 MD가 직접 사용하고 먹어본 최고의 상품을 파격가에 만나는 공동구매 특가쇼핑! ◆이것이 진짜 소셜커머스다! 출산, 유아동, 패션, 뷰티, 마트, 산지 직송 상품 등 내가 원하는 할인 상품들이 가득.일반 소셜커머스보다 저렴하게 진정한 할인 쇼핑을 보여드립니다. ◆ 더욱 스마트한 쇼핑 파트너 가성비 높고 반값할인을위하여 고객님에게 제공하기 위해 태어난 주연홈쇼핑 공동구매 쇼핑어플! 최저가 상품을 원하신다면 주연홈쇼핑의 파트너가되어주세요 ◆ 최저가 비교 언제나 환영! 각 소셜커머스와 오픈마켓과 가격비교 언제나 환영! 이젠 시간 낭비 하지 마세요새로운 최저가 쇼핑의 등장! [앱 접근권한 안내] 2017년 3월 23일부터 시행된 정보통신망법령 제22조의2(접근권한에 대한 동의)에 따라 서비스 이용 시 꼭 필요한 접근권한을 아래와 같이 안내드립니다. 1. 필수적접근권한 -기기및 앱 기록 : 앱상태(버전) 확인 -ID : 기기 식별 및 광고 트래킹 -WIFI연결정보 : 앱 이용네트워크 체결 2. 선택적 접근권한 - 저장공간 : 안전 결제 진행시 V3Mobile 설치 파일 저장 주연홈쇼핑 앱은단말기 접근권한에 대해 이용자의 동의를 받아 접근하며, 선택적 접근권한의 경우, 거부하셔도 서비스 이용이 가능하고,앱내설정을 통해 변경하실 수 있습니다.